Andres Duany forwarded this to a professional list-serv, so I haven’t found the source yet, but the point remains. They’re going to change our cities as drastically as the population bubble equal, the boomers. Many grew up in places where to get around at all, to any thing, anywhere, any friends, meant having a parent or guardian, aka chauffeur, drive them around. 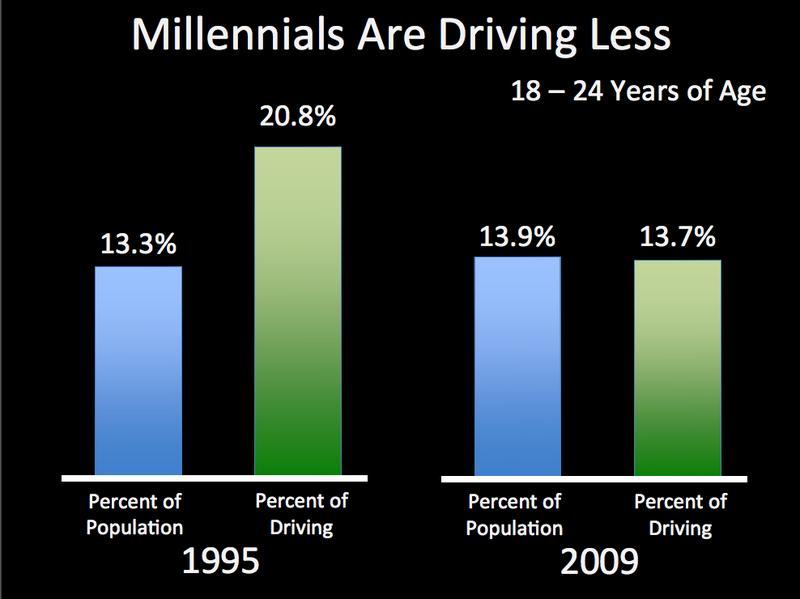 This is why there is a negative reaction from the demographic to cars. The more we fight it, the stronger the reaction will be. At any one time, 50% of the population is either too old, too young, or too poor to drive, yet we build a world where no other option, but dependence. On cars, on others. Speaking for myself, when I was 13, 14, the bicycle was cherished. It meant freedom. Certainly not the school bus driver or waiting for mom to come home from work and the last thing she wanted to do would be to get back into the car after commuting to/fro. And we’re left with a situation where schools budgets are busted by bussing, police departments are spending time, money, man-hours on cruisers and regulating traffic rather than as integral parts of the community. Either of which could be spending the same money on, I don’t know, salaries? More staff to help the cause?